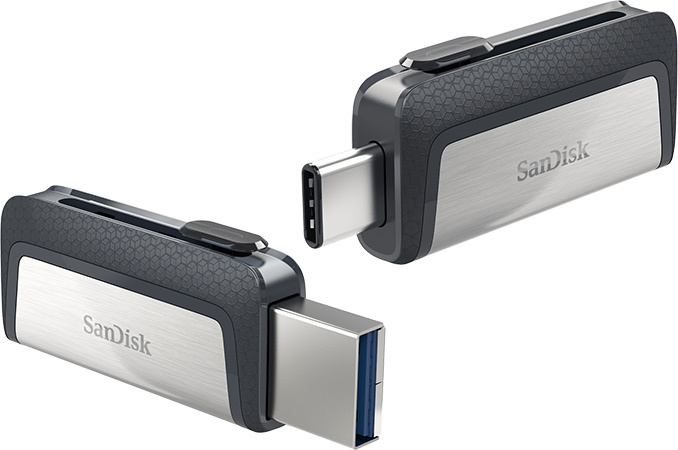 Last year SanDisk released its first-gen USB flash drives featuring two types of connectors: USB-A and USB-C in a bid to address the growing market of devices featuring USB Type-C, but retain compatibility with billions of legacy devices. This year, SanDisk introduced a new generation of such drives with adifferent design and higher-capacity options. The second-generation SanDisk Ultra Dual Drive USB Type-C family of USB flash drives includes models with 16 GB, 32 GB, 64 GB and 128 GB of NAND memory. The drives offer transfer speeds up to 150 MB/s and are compatible with all devices featuring USB-A and USB-C receptacles. Furthermore, they are also compatible with SanDisk’s Memory Zone app for Google Android to manage and backup content on devices running the OS. Introduced commercially in 2015, the USB Type-C connector is rapidly gaining traction among suppliers of PCs, smartphones, tablets and other electronics. For manufacturers of peripherals adoption of new ports by devices is an important factor because they want to address broader audiences with their products. While USB Type-C is gaining popularity, there are still way too many systems featuring USB Type-A ports, which is why it makes a lot of sense to build peripherals compatible with both types of USB. Moreover, analysts from Strategy Analytics believe that even by 2020 only about 44% of mobile phones will use USB-C, which is a remarkable growth, but which still means that 56% of mobile phones will keep using other types of connectors. SanDisk and its partners are already selling the new drives with 16GB, 32GB, 64GB and 128GB capacities for U.S. MSRPs of $19.99, $29.99, $39.99 and $69.99, respectively. "44% of mobile phones will use USB-C, 66% of mobile phones will keep using other types of connectors." If phones would use both, they'd have a Type C connector. If they'd have a Type C connector, they'd be in the 44%. Just nitpicking, since the typo was already fixed. However, the distinction is useless wrt to the announced product, because if the phone won't have a Type C connector, this stick won't help you much, since the same phone will most definitely not have a Type A connector either. You'll still need an additional cable.